The industrial building at 204 E. Mayflower Avenue in North Las Vegas was recently sold for $2.8 million. Ulf Buchholz/Las Vegas Business Press. • Diamond Coast Group LLC purchased 24,408 square feet of industrial property at 204 E. Mayflower Ave. in North Las Vegas for $2.8 million. Brian Riffel and Tyler Jones of Colliers International represented the seller, Harlan Land Co.
• GHV Group LLC purchased the 11,280-square-foot office building at 7560 W. Sahara Ave. in Las Vegas for $1.47 million. Jarrad Katz and Galit Kimerling of MDL Group represented the seller, MLF Receivership Inc.
• Sakic LLC purchased 8,500 square feet of office/warehouse space at 4850 W. Oquendo Road in Las Vegas for $1.2 million from DK Land LLC. Jarrad Katz and Galit Kimerling of MDL Group represented Sakic. • CDH Convenience LLC purchased 2.16 acres of land at 9180 W. Post Road in Las Vegas for $1.15 million. Robert Torres and Scott Gragson of Colliers International represented the seller, Sunset Post FF450 LLC. • Scott Poncher, trustee of the Scott Poncher Separate Property Trust, purchased 5,053 square feet of industrial spaceat 1051 Olsen St, Suite 3911 in Henderson for $523,640. Sam Scaletta of MDL Group represented the seller, Ten Buildings LLC. • RGR Investors LLC purchased 1,200 square feet of retail space at 4211 W. Sahara Ave., Suite F in Las Vegas for $230,000. Hillary Steinberg and Michael Boscia of MDL Group represented the sellers, Roger Corbelle and Rosalva Corbelle. • Unifern LLC leased 31,642 square feet of industrial space in Black Mountain Eastgate Center at 7710-7720 Eastgate Road in Henderson. Sam Scaletta of MDL Group represented the landlord, Black Mountain Eastgate Center. 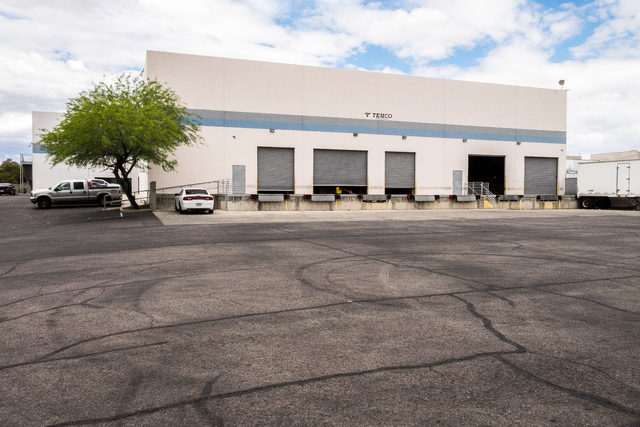 • Four Queens LLC leased 29,136 square feet of industrial space in North Las Vegas Distribution Circle at 4171 Distribution Circle, Suite 101, in North Las Vegas. Dan Doherty, Susan Borst, Chris Lane and Jerry Doty of Colliers International represented the landlord, Icon PAC Nevada Owner Pool 3 Nevada. • Liturgical Publications leased 10,539 square feet of industrial space in Black Mountain Eastgate Center at 7485 Commercial Way in Henderson. Sam Scaletta of MDL Group represented the landlord, One Commercial Way LLC. • Off The Wall Painting leased 9,710 square feet of industrial space in Arville Commerce Center at 4630 Arville St. in Las Vegas. Sam Scaletta of MDL Group represented the landlord, Biotronics. • Conn Appliances Inc. leased 8,642 square feet of industrial space in the Arrowhead Commerce Center (Building 5) at 3595 E. Patrick Lane, Suite 900, in Las Vegas. Spencer Pinter, Dan Doherty, Susan Borst, Chris Lane and Jerry Doty of Colliers International represented the lessor, KTR LV IV LLC. • BTB Products leased 6,303 square feet of industrial space in Traverse Pointe at 900 Wigwam Parkway in Henderson. Sam Scaletta of MDL Group represented the landlord, Traverse Point Development. • U.S. Jaclean Inc. leased 6,250 square feet of industrial space in Blue Diamond Business Center at 8050 Arville St., Suite 110, in Las Vegas. Dean Willmore, Dan Doherty, Susan Borst, Chris Lane and Jerry Doty of Colliers International represented the lessor, Juliet Properties. • Aquavit Life Sciences Inc. leased 6,221 square feet of industrial space in McCarran Commerce Center at 385 Pilot Road, Suite F, in Las Vegas. Dan Doherty, Susan Borst, Chris Lane and Jerry Doty of Colliers International represented the lessor, DM Airport LLC. • Escapology leased 5,865 square feet of retail space in Sunrise Plaza Shopping Center at 2797 S. Maryland Parkway, Suites 8-10, in Las Vegas. Hillary Steinberg of MDL Group represented Escapology. • Seasons Hospice &Palliative Care leased 4,782 square feet of office space in The Gramercy at 9205 W. Russell Road, Suite 305, in Las Vegas. Alexia Crowley of MDL Group represented Seasons Hospice. • Petals Flowers &Events leased 4,689 square feet of industrial space in the Whitney Mesa Business Park II at 1860 Whitney Mesa Drive, Suite 150, in Henderson. Jarrad Katz and Galit Kimerling of MDL Group represented the tenant. • T Motors LLC leased 3,731 square feet of industrial space at 6245 Harrison Drive, Suites 7 and 30-32, in Las Vegas. Marty Martell of MDL Group represented T Motors. • Grant a Gift Autism Foundation leased 3,653 square feet of office space in Rancho Palomino Park at 630 S. Rancho Drive, Suite D, in Las Vegas. Jerry Hagfeldt of MDL Group represented the landlord, Rancho Palomino LLC. • The Point Ministries leased 3,500 square feet of industrial space in Arville Business Park at 4350 S. Arville St. in Las Vegas. Lisa Anderson and Sam Scaletta of MDL Group represented the landlord, TNP Notes Arville LLC. • The Sleep Center of Nevada leased 3,346 square feet of office space at 2920 N. Green Valley Parkway, Suite 313, in Henderson. Alexia Crowley and Jerry Hagfeldt of MDL Group represented the landlord, 2910 N Green Valley LLC. • Dynamic Urgent Care LLC leased 3,118 square feet of office space in Sunset Ridge Plaza at 2920 N. Green Valley Parkway, Suite 800, in Henderson. Alexia Crowley and Jerry Hagfeldt of MDL Group represented the landlord 2920 N Green Valley LLC. • Verifone Inc. leased 3,048 square feet of office space in Hughes Airport Center at 980 Kelly Johnson Drive, Suite 120, in Las Vegas. Jarrad Katz and Galit Kimerling of MDL Group represented Verifone. • Blair A. Ison DDS leased 2,633 square feet of medical office space in Cascade Valley Court at 7180 Cascade Valley Court, Suite 100, in Las Vegas. Pete Janemark of Commerce Real Estate Solutions represented Ison and Michael Boscia; Alexia Crowley of MDL Group represented the landlord, Cascade Valley Court LLC. • Roberto’s Taco Shop LLC leased 2,397 square feet of retail space in Black Mountain Marketplace, 72 W. Horizon Ridge Parkway, Suite 150/155, in Henderson. Chris Emanuel of Virtus Commercial represented the landlord, Black Mountain 1 and Black Mountain 2. • Cycle Corp Fitness LLC leased 2,272 square feet of retail space at 10730 S. Eastern Ave., Suite 130, in Henderson. Hillary Steinberg of MDL Group represented Cycle Corp.
• Creative Solutions LLC leased 2,080 square feet of industrial space in Annie Oakley Business Park at 4045 E. Post Road in Las Vegas. Renae Russo of Colliers International represented the lessor, Gifford Consulting LLC. • Mach 1 Plumbing leased 2,000 square feet of industrial space in Western Industrial at 2325 Western Ave. in Las Vegas. Marty Martell of MDL Group represented the landlord, Fleming Family Trust. • Technoscribe LLC and Rodolfo Jane LLC leased 2,000 square feet of retail space in Black Mountain Marketplace at 72 W. Horizon Ridge Parkway, Suite 100, in Henderson. Chris Emanuel of Virtus Commercial represented the landlord, Black Mountain 1 and Black Mountain 2.